A pick-up/drop-off zone (PUDO) in Georgetown. Image by David Alpert. Cities are constantly responding to new technology and residents' evolving needs, and the curb is one place where big changes are happening. Ride-hailing services like Uber and Lyft have expanded in the past few years, as have delivery trucks as more and more people get deliveries from Amazon, Instacart, and other delivery services. Yet most of the space along our curbs has long been dedicated to parking private vehicles, reducing the space available to these new road users to pull to the curb. Instead, they can end up potentially blocking other road users as well as pedestrian traffic. 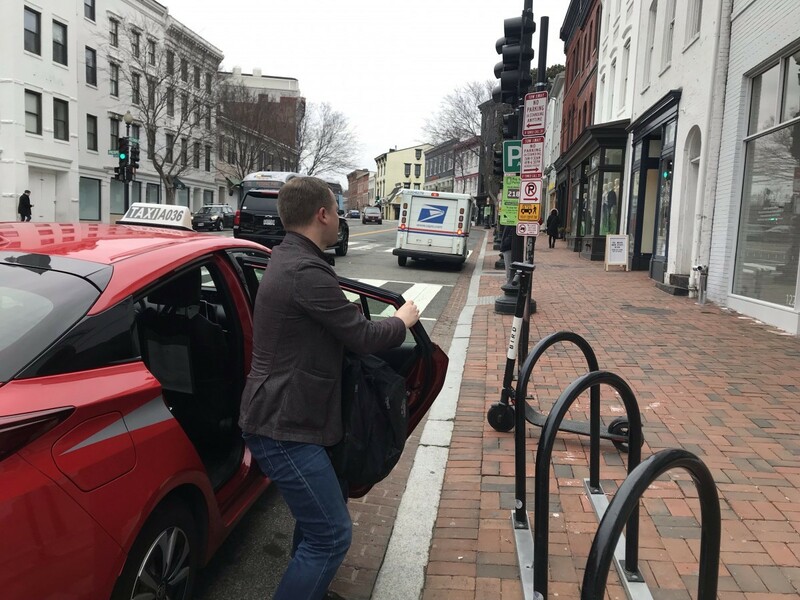 To address this, the District Department of Transportation (DDOT) set up a special zone on Connecticut Avenue in 2017 dedicated to vehicles picking up and dropping off. It announced six more pick-up/drop-off zones (elegantly abbreviated “PUDOs”) in October 2018. The agency plans to add more areas in the future. Check out this list: is there a PUDO near you? Urban design, especially in terms of land use, is one of our best tools to make journeys safer and more efficient. In recent years, the existing design of our road and curbside space hasn’t been able to keep up with changing use, resulting in slower journeys for nearly everyone and in roads that are less safe for drivers, pedestrians, cyclists, and scootists alike. Residents and workers use curbside areas several times a day: for parking cars, for loading and unloading commercial vehicles, for getting in and out of ride-hailing services or taxis, for stepping into the street to check if it’s safe to cross, for leaning a bike or scooter while paused at a stop sign or red light, and more. The rules and pricing around these valuable public assets have a huge impact on how they’re used. 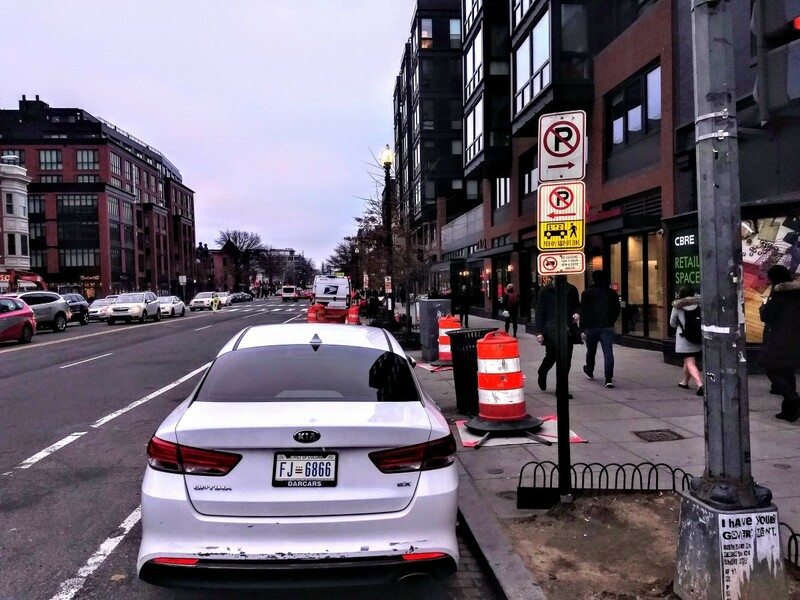 Concerns that misuse of traffic lanes is compromising safety as well as traffic flow prompted DDOT to designate several curbside areas throughout the District as PUDOs. A pick-up/drop-off zone (PUDO) on 14th Street NW. Image by Dave Murphy. 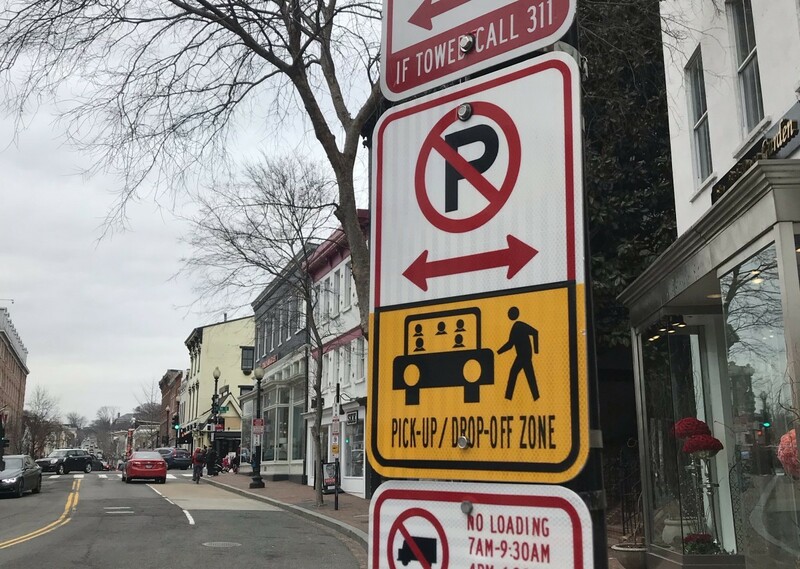 One key issue is vehicles blocking lanes to perform short-term, stationary functions—in other words, double parking, which makes lanes (including bike lanes) unavailable while delivery trucks, taxis, and ride hailing vehicles drop off and pick up goods and passengers. Designating specific zones for pick-up/drop-off activities might help with other urban scourges too, like the danger and inconvenience posed by delivery trucks parked in driveways that run directly across sidewalks, which forces pedestrians into the street or around the front of large vehicles where drivers have limited visibility. Giving truck drivers somewhere appropriate to fulfill their functions could help people walking stay safe, especially those with mobility challenges and those who are walking with small children. How are the PUDOs working out? Other cities have deployed PUDOs to address congestion and road safety. A PUDO program in Fort Lauderdale, Florida, part of its Vision Zero initiative, has shown positive results. A recent evaluation showed that designated PUDOs along a heavily-trafficked route had improved traffic flow and reduced delays, and ride-hailing and delivery vehicles heavily used the zones. Fort Lauderdale's wider package of reforms, focusing on balancing the needs of different road users through redesign, also significantly sped up journeys for emergency vehicles and reduced speeding along this key corridor. A PUDO in use in Georgetown. Image by David Alpert. So will PUDOs keep expanding around the region? Some things to watch for include whether the zones being used frequently and whether they're being used properly. Good signage and promotion by ride-hailing and delivery companies will factor into this. PUDO zones also require taking away a few parking spaces. As illustrated in the recent heated discussions around a protected bikeway in Dupont Circle, any proposal that reduces parking, especially in residential areas, can bring out resistance from the Not In My Parking Space camp. But communities have thus far been very supportive of the very small number of space changes for these zones. Fundamentally, PUDOs require us to rethink how our physical public assets can be structured to reflect cities' changing needs and priorities. Jurisdictions must figure out which needs and priorities must take precedence in order to allow us to build a city we all want to live and work in for decades to come.